Authentic Jamaican Jerk chicken – how can you make it easy? 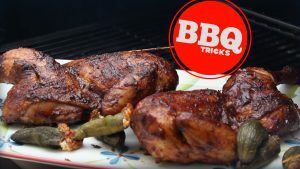 Most often you’ll get leg quarters… With the skin scored… Jerk spice rub is typically a fiery blend of allspice, Scotch bonnet peppers and sometimes scallion, thyme, ginger, even rum. The folks i talked to in the video were big into escovitch (pickled vegetables). 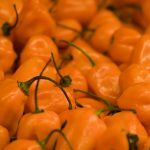 The habanero is the standard scotch bonnet substitute- they are different, but the same species. When ripe, the Scotch bonnet looks sort of like a little squashed reddish orange paper lantern. Good news is the leg quarters are really affordable.. Start with that. I used half Chickens here but the breast is less forgiving than the dark meat – that’s why competition BBQ teams use thighs exclusively… I also used the remaining sauce in the small blender after coating chicken and added 4 tablespoons of cane syrup and 4 tablespoons of texas pete plus another habanero and blended to create a VERY hot but wonderful hot sauce. Great flavor. Score chicken and heat smoker to 275°F. Brush the chicken with canola oil. Combine the remaining ingredients in a blender or food processor and pulse until smooth and sticky. Use apple or cherry wood chips for a sweet smoked flavor and throw in a few of the whole allspice berries as well. Brush mixture on chicken and under skin. Smoke approximately 45 minutes – 1 hour. Remove chicken from the smoker when the temperature is 160°F and let it stand about 10 minutes so it will be at the targeted temperature of 165°F by the time you are ready to eat. Baste with additional jerk seasoning before serving.